In Barcelona there are two major local holidays, La Laia, celebrated as Barcelona’s Major Winter Festival on February 12th, and La Mercè, September 24th, a three-day farewell to the summer months. Both holidays are popular street parties with activities for all ages, parades, concerts, sardanes (a tradtitional Catalonian circle dance), els gigants (giant puppets used in the parades), and castellers (the human towers that Catalonians make as a show of solidarity). usually performed outdoors, and is often done over pavement in town squares. After a few tragic accidents, the children who climb the adults to become the peaks of these towers are now required to wear helmets for their safety should they fall. But what is the why behind these celebrations? These celebrations are to celebrate the existence of Barcelona’s two patron saints, Saint Laia, and The Virgin Mercè. Both are holy figures believed to have performed miracles for Barcelona and endured impossible hardships for their faith, and both compete for their places in the hearts of Barcelona’s people. While Laia was the first patron saint on the scene in Barcelona, La Mercè continues to be the better known of the two festivals. Despite the religious character of these two figures, in Barcelona there is a legend that has grown up around the city’s twin patron saints of a less-than exemplary rivalry. La Laia and La Mercè. Once upon a time, in a land you may have heard of, called Catalonia, where the people lived and worked hard, there was a great port. Around that port there grew a city, and that city was known as Barcelona. With time, Barcelona became a great commercial center, and prospered. Her people were strong in their faith, and they knew they had a protector in God, and his servants. So it was that in the times of the Roman emperors in Barcelona there was a young girl, not more than thirteen, that refused to deny her beliefs. Such was her faith that she died to defend her God in her city. God was pleased with her, and her city was proud. 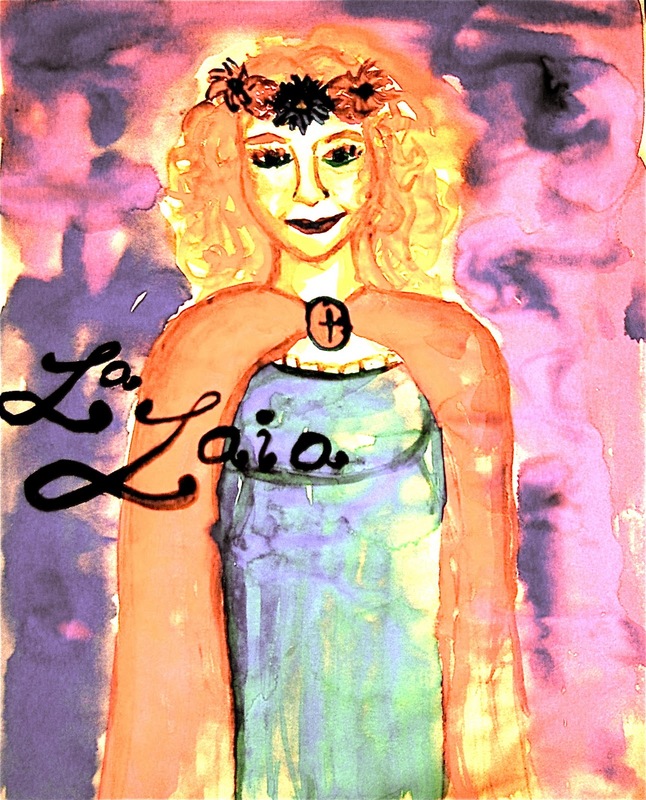 So Laia was rewarded with the title of patron saint in Barcelona and for many years enjoyed her place as the reason for the city’s favorite yearly celebration. Every year, on February 12th; she was remembered and celebrated as the brave girl that fought to the death for her and Barcelona’s faith against the Romans. In the parades, the dear people of her city carried banners and giant figures called gigants that portrayed her as a pretty young girl with flowers in her hair, in a blue dress with a red cape (blue and red are Barcelona’s colors), and the festivities made her smile. But her happiness was not to last forever. Some years later, in the middle ages, Barcelona was under siege by the moors, and her God was losing his faithful. So God sent a vision of the Virgin, La Mercè to San Pedro Nolasco, and Spain’s King, Jaime I, to restore the faith of Barcelona’s people in their protector. It worked, and while Laia was grateful to see Barcelona’s faith restored, she was also worried that she would be forgotten. When Barcelona made La Mercè her patron saint and protector, and decided that a new festival should be celebrated in September, Laia cried and cried and then was furious. So they think I can’t protect them. My sacrifice wasn’t good enough, just a child am I? They want a full-grown saint do they? Laia swore she would make the people of Barcelona regret their decision. But as God continued to protect Barcelona, her people slowly forgot about Laia and the sacrifice she had made so many years before. If it weren’t for the grand party and all the important events connected to her name, many people would have forgotten about La Mercè as well. 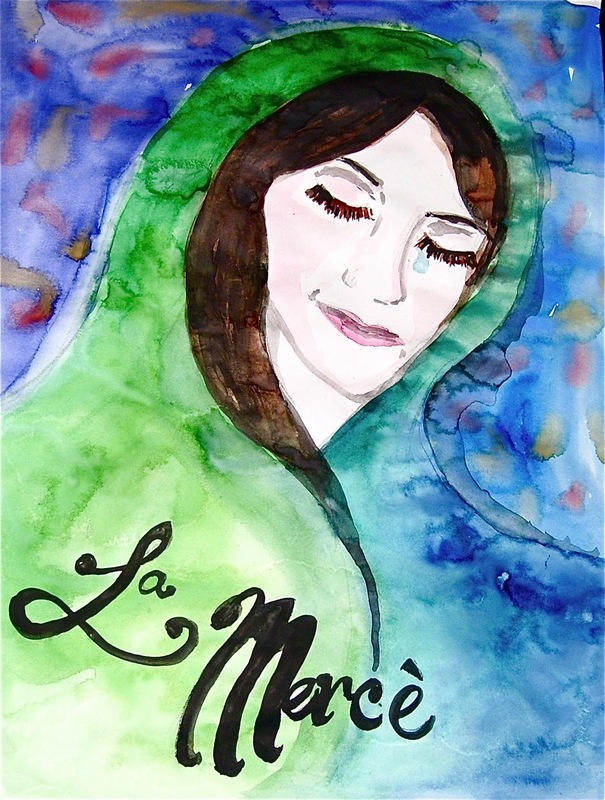 La Mercè didn’t mind, for she had been named for her mercy, and was merciful. She would give nothing but God’s mercy to his people. She was only sorry Laia was so upset, and regretful there was nothing she could do to help the young saint…. except…. God is merciful too and so La Mercè went to him, and made her small request. Speaking ever so softly in our Father’s ear, her lips curved as she thought of the small joy Laia might receive. Meanwhile, Laia continued to plot and cry. But her tears were swiftly stopped by the knowledge that she wasn’t alone. There was La Mercè, standing beside her bed, reaching out to put a gentle hand on her shoulder. “I’m very sorry Laia,” said La Mercè. “ I would never willingly upset you. I have a proposition for you, and I would like to see what you think. To make sure Barcelona and her people never forget you, or your sacrifice, God will plant a story in the head of a poet, and that poet will spread the tale. To make the story stand the tests of time and human memory, God will make sure the story comes true every year, without fail. Laia was touched and humbled by La Mercè’s efforts and once again began to cry. Her God was just, even when she was selfish, so that she was consoled and gave thanks. So it goes that every year during the now mostly secular festivities of La Mercè, it rains and for the smaller festivities of La Laia the sky remains clear and cloudless. While time has all but erased the sacrifices La Laia and La Mercè made for their faith and their city, her people still remember the story God whispered in the poet’s ear.